Did you grow up with these toys? 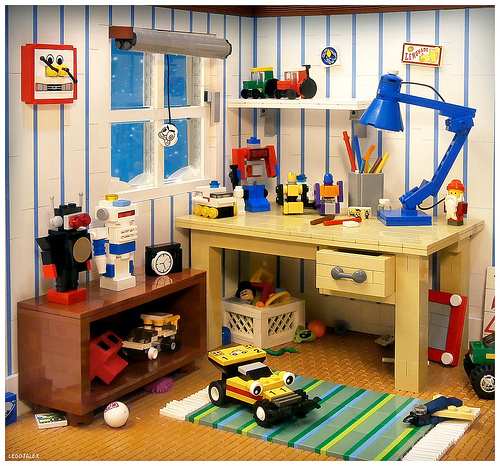 LegoJalex built an elaborate kid’s room from the 80’s featuring many iconic toys from the time. How many do you recognize? If HEATHER BRAATEN were alive she’d love this just as much as I do. Heather was known to the AFOL Community as LEGO GIRL! To see my tribute to her follow this link: http://www.mocpages.com/moc.php/318529 so I’d say a job well done! Love the VIEW MASTER, and the ETCH A SKETCH!!! What no lLINCOLN LOGS? I may not have grown up in the 80’s, but I remember one toy there from my childhood: LEGO bricks. LOL! I can see Transformers Optimus Prime and Bumblebee, and a GI Joe Snowcat. Trying to figure out what the white vehicle is with the yellow wheels, next to Optimus Prime. Also slightly puzzled by the orange and purple figure: a He-Man figure perhaps?